Andreas Köstenberger and Justin Taylor, with Alexander Stewart. The Final Days of Jesus: The Most Important Week of the Most Important Person Who Ever Lived. Wheaton: Crossway, 2014. 224 pp. $17.99. 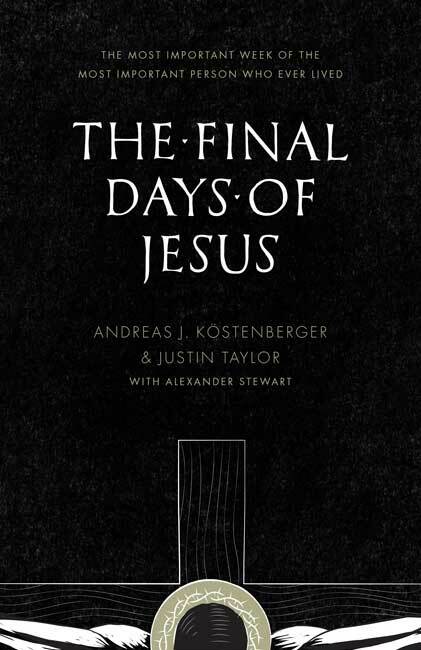 Andreas Köstenberger, an outstanding biblical scholar from Southeastern Seminary; Justin Taylor, the well-known blogger and publisher at Crossway Books; and Alexander Stewart, a research assistant for Köstenberger; have teamed up to write a book on the last days of Jesus—that is, the final week of his life. The authors primarily march through the week day by day, from Palm Sunday to Easter Sunday, though they also include a brief epilogue that includes other resurrection appearances, the Great Commission, and Christ’s ascension. The format of the book is easy to follow, and the commentary is brief and consistently excellent. For each day in the final week of Jesus’ life, the events are listed, the scriptural passage (or passages) pertaining to the event is printed, and a commentary on the passage is provided. The Final Days of Jesus should prove to be helpful for pastors, teachers, and interested laypersons who preach and teach about the events in our Lord’s last week. Moreover, those who desire to meditate on Jesus’ last week will find this to be an excellent resource as well. One of the main advantages of Köstenberger and Taylor’s book is its brevity. Here is a resource that pastors and teachers will be able to read in advance of teaching, for the commentary is concise and accessible. I especially found helpful the numerous tables that illustrated events or other truths. Sometimes busy pastors and teachers don’t have the time to plunge into technical details about Jesus’ crucifixion and resurrection, and yet they need to be informed by responsible scholarship about what occurred. This book serves that need. Though Köstenberger and Taylor maintain that Jesus died in AD 33, the content of the book doesn’t depend on agreeing with such a date, and they don’t devote much space to the matter. Some technical matters regarding authorship of the Gospels, their historical accuracy, and harmonization are examined in the introduction. Even here the discussion isn’t technical and may be one many readers wish to skip. Still, it is plain from the introduction that the authors are conservative evangelicals. They believe the Gospels were written by Matthew, Mark, Luke, and John respectively. They also defend the notion of harmonization, which is out of fashion in many circles. Still, Köstenberger and Taylor don’t claim “inerrancy” for their proposed harmonizations. The Gospel accounts can be harmonized historically, but the harmonization proposed (or harmonizations proposed) is one way of accounting for the evidence. The principle here is illustrated well with the story of Mary coming to the tomb on Easter morning. The when and where and what of her actions that morning are difficult to reconstruct in their entirety. The authors humbly propose two or three possibilities, recognizing the difficulty of being certain about what happened. Köstenberger and Taylor rightly believe in the historical accuracy of the Gospels and in the notion they can be harmonized, but they also realize their harmonizations are tentative. The Final Days of Jesus is particularly helpful historically in providing understanding of national feasts like Passover and the Unleavened Bread. The elements of the Passover meal are sketched in, we’re reminded the Passover had to be eaten in Jerusalem, and we’re told it would be unusual for a man to carry a water jug since that was usually a woman’s responsiblity. The seating custom and arrangement for the Passover meal Jesus celebrated with his disciples is also helpfully relayed. The theological significance of Jesus’ final days is also briefly related. His last Passover meal wasn’t merely the observance of a Jewish ritual, for Christ instituted the Lord’s Supper at this meal, with the bread and wine symbolizing his death for the forgiveness of sins. Similarly, the footwashing of the disciples represents their cleansing from sin, their need for continual forgiveness, and constitutes an example of humble service. Or, when Jesus says he’s the true vine in John 15, he identifies himself as the true Israel. I could multiply examples to demontrate that Köstenberger and Taylor often unpack the theological significance of what occurred. The clear and brief commentary in The Final Days of Jesus is one of its greatest strengths, but naturally we as readers may want more explanations at some points. For instance, it would be interesting to hear more discussion historically and theologically about why Jesus was charged with blasphemy at his trial. Köstenberger and Taylor also note the irony present in Jesus’ trial and death, but a few more comments along this line would have been instructive. Yes, the soldiers were mocking Jesus in calling him the Christ, but they were also speaking better than they knew, for the Christ was revealed especially in his suffering. Along the same lines, the freeing of Barabbas makes a literary and theological point: the guilty one is set free (Barabbas) since the innocent one suffers in his place (Jesus). This isn’t to say Barabbas became a believer, but the Gospel writers want us to read this story at more than one level. We can be grateful for this historically anchored and reverent work, one which also sets forth for us the theological significance of what Jesus accomplished in his final days.